Starting May 10, 2011, Carnival Cruise Lines will begin its second season operating Alaska cruises round-trip from Seattle, Wash., with the line’s 2,124-passenger Carnival Spirit, sailing a total of 19 seven-day Glacier Route voyages through Sept. 6, 2011. During its Alaska sailings, Carnival Spirit will visit the stunning Alaskan ports of Skagway, Juneau and Ketchikan, along with Victoria, British Columbia, giving guests the opportunity to experience the region’s breathtaking landscapes and incredible wildlife. Guests also will cruise Alaska’s Tracy Arm Fjord, a natural wonder full of vibrant marine wildlife, towering ice-capped mountains and spectacular waterfalls. In Skagway, guests can relive the Gold Rush days in a charming downtown area complete with wooden sidewalks, restored inns and saloons that once were filled with gold-crazed adventurers looking to strike it rich. Carnival cruisers visiting Juneau will find great shopping, fine dining and world-class museums along the streets of this small town lauded for its down-home feel, yet cosmopolitan sophistication. Ketchikan, a popular destination along Alaska’s famed Inside Passage, also is known for its impressive selection of museums and cultural centers featuring Native American dance, carvings and artifacts. One of the best ways to see the area and enjoy the scenery is simply to take a walk through town and visit the Totem Heritage Center. Ketchikan is referred to by many as the “Salmon Capital of the World,” and as you’d expect, the salmon are plentiful and fresh so guests won’t want to miss out on the town’s most famous export. 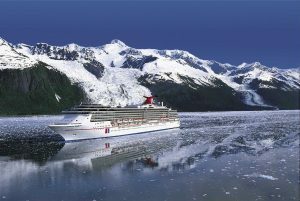 All this, combined with the Carnival Spirit’s wide array of dining, entertainment and activity options and the line’s unmistakable brand of fun, makes for the ideal Alaska vacation. To book a “Fun Ship” Alaska voyage, contact any travel agent, call 1-800-CARNIVAL or visit carnival.com.